Iyama’s New Records: As reported previously (Iyama Yuta Achieves Rare ‘Triple Crown’ with 38th Meijin Victory 10/19) Iyama Yuta won the fifth game of the 38th Meijin title match, played on October 16-17, taking the title from Yamashita Keigo with a 4-1 score. Iyama did very well to win four games in a row after losing the opening game of the best-of-seven, though Yamashita did make a gift of the third game. 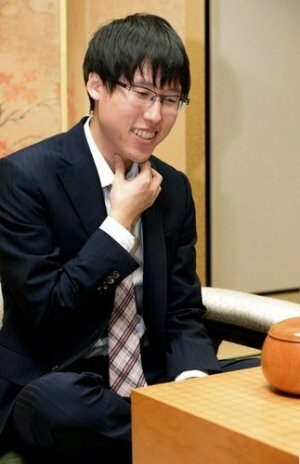 By making a comeback as Meijin after an absence of two terms, Iyama not only won his 20th title, he also became the second player to win the Big Triple Crown of Kisei, Meijin, and Honinbo. As usual, he set a record as the youngest so far (age 24 years four months). As the same time, he reassembled his sextuple crown, with the Meijin replacing the Judan. Since there was a gap, this counts as the second time he has held a sextuple crown. The previous player to hold the Big Triple Crown is Cho Chikun or 25th Honinbo Chikun. He first achieved the feat in 1983 at the age of 26 years eight months and he maintained it for just over four months, from March 18 until July 28, 1983. He repeated the feat in 1996 (at the age of 40 years four months), and this time he held on to the top three titles for the better part of three years, that is, from November 8, 1996 to July 6, 1999. The first time Cho achieved this success, he also held the Judan title; holding the top four titles simultaneously might seem to be still a goal for Iyama, but actually the Judan has been downgraded to the number seven title, as the sponsors reduced the prize money from 15 to seven million yen. Iyama’s six titles are the top six, so he has far surpassed Cho. More trivia (this information all comes from the October 28 issue of Go Weekly): Cho won the Big Triple Crown 14 years 11 months after becoming a pro to Iyama’s 11 years six months. Iyama is the third player to hold the Kisei and Meijin simultaneously (the third is Kobayashi Koichi) and the eighth Meijin-Honinbo. Iyama has now won six big-three titles to Cho’s 29 ? here, at least, he has a long way to go. Finally, it’s worth noting that this is the first time Osakan players have held all the seven top titles. It’s the first time Tokyo has been shut out. Iyama Yuta completes Japanese trifecta with 38th Meijin victory, where there are also more photos. Kato Loses Sole Lead In Women’s Meijin League: Just one week after taking the sole lead in the 26th Women’s Meijin League, Kato Keiko 6P let it slip. In the official chart for the league, as published in Go Weekly, the game in which she beat Suzuki Ayumi on October 10, is listed as her November game, and the game with Mukai Chiaki 5P described below is given as her October game (she was playing in successive weeks to open up time for maternity leave in November), though it was played later, on October 17. Taking black, Mukai won by 7.5 points. Another game was played on October 24. Chinen Kaori 4P (B) beat Ishii Akane 2P by resignation.